Use the Hair material to render hair, fur and curves. This material is composed of 3 specular components, the primary corresponding to reflections on the surface of the fibers, the secondary corresponding to internal reflections inside the fibers, and the back corresponding to transmission through the fibers. Additionally, reflections between fibers are simulated with a multiple scattering approximation. Eventually, a simple non physically based diffuse component is provided. Primary is the amount of primary specular reflected by the fiber. Secondary is the amount of secondary specular reflected by the fiber. This specular component is reflected through the fiber, and is colored. 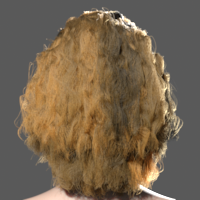 Back is the amount of specular transmitted through the fiber. This component is mostly visible in back lighting. Multiple Scattering simulates the scattering of light through the volume of numerous fibers, instead of a single scattering. Combine this with the previous components to create convincing diffuse and soft hair. Multiple Scattering requires the Attributes -> Shading -> MS Approximation attribute to be checked. Diffuse is a simple diffuse approximation using Kajiya-Kay shader. Use this to render non photo-realistic hair. The hair rendered with Multiple Scattering = 1 compared to Diffuse = 0.5. Using the Color attribute, a simple RGB color. Using the Melanin attributes to control the hair melanin density, to get plausible human hair colors. Using the Absorption attribute with mesured RGB absorption values. Modulate the color from the tip to the root using the Tip/Root Color attributes. 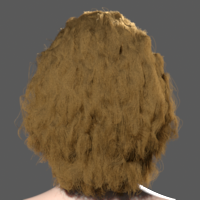 Randomize the hair color per clump or per fibers using the Clump and Fiber Random attributes. Add mutant hairs, like white hairs, using the Fiber Mutant attributes. Color controls the general appearance of the hair. Light scattering and hue shifting may result in slightly different colors, so this control is an approximation of the resulting color. Different color settings, from brown to white. Root Color is multiplied to the Color at the root of the fiber. White leaves the color unaffected. Root Color, white, green and red. Tip Color is multiplied to the Color at the tip of the fiber. White leaves the color unaffected. Tip Color, white, green and red. Color Shape moves the blending area between Root Color and Tip Color towards the fibers root or tip. Lower values result in blending closer to the root, higher values result in blending closer to the tip. Color Shape = 0.6, 0.75 and 0.9. Specifies the fiber absorption properties, for red, green and blue. The corresponding color is multiplied to the general Color. Lower absorption values result in lighter hair, while higher absorption values result in darker hair. 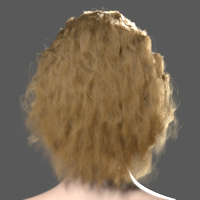 To render the hair with a specific absorption, set Color -> Color to pure white. Absorption set to (0,0,0), (0.03,0.07,0.15) and (0.06,0.14,0.3). Specifies the density of melanin which contributes to the hair resulting color. This parameter along with Melanin Mix are based on [d'Eon11], and provides an easy and consistent control of human hair colors. Lower density values result in lighter hair, while higher density values result in darker hair. Similarly to Absorption, the corresponding color is multiplied to the general Color. 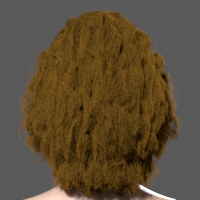 To render the hair with a specific melanin density, set Color -> Color to pure white. Specifies the ratio between eumelanin and pheomelanin in the fibers. Lower values result in darker and brown hair color, higher values result in lighter and red hair color. Clump -> Hue Random controls the amplitude of the hue noise. Clump -> Hue Random = 0, 0.5 and 1. Clump -> Value Random controls the amplitude of the value noise. Clump -> Value Random = 0, 1 and 4. Clump -> Random Scale controls the noise frequency for clumps hue and value randoms. Lower values result in smooth varations, higher values result in rapid variations. The clump random is based on the scalp UV texture coordinates, thus the actual noise frequency scaling is dependent of the UV layout. Clump -> Random Scale from lower to higher value. Fiber -> Hue Random controls the amplitude of the hue noise per fiber. Fiber -> Hue Random = 0, 0.5 and 1. Fiber -> Value Random controls the amplitude of the value noise per fiber. Fiber -> Value Random = 0, 1 and 4. Fiber -> Mutant Color controls the color of mutant fibers. Use this to create random white hair fibers, for instance. Fiber -> Mutant Color as white, red and green. Fiber -> Mutant Ratio controls the ratio of mutant fibers. Fiber -> Mutant Ratio = 0 results in no mutated fibers, Fiber -> Mutant Ratio = 0.5 results in half mutated fibers, and Fiber -> Mutant Ratio = 1 results in all fibers mutated. Fiber -> Mutant Ratio = 0, 0.1 and 0.5. These parameters control the appearance of the specular components. Specular -> Width controls the width of the specular cones. Small values result in sharper speculars, while higher values result in wider and smoother speculars. Specular -> Width = 5, 10 and 15. Specular -> Shift controls the shifting of the specular cones. 0 leaves the specular components unshifted, positive values shift the primary towards the root and secondary and back towards the tip. Specular -> Shift = -10, 0 and 10. Since Multiple Scattering is based on the specular components, Specular -> Width and Specular -> Shift also affect the appearance of Multiple Scattering. 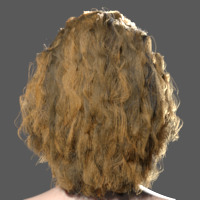 Self shadowing attenuates the hair color at the root of the fibers. 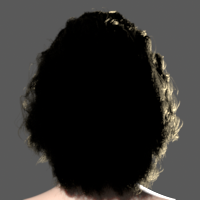 Self Shadow does not affect the primary specular. Self Shadow -> Amount controls the amount of attenuation. 0 doesn't attenuate the color, 1 results in black color at the root. Self Shadow -> Amount = 0, 0.5 and 1. Self Shadow -> Position controls the end of the attenuation along the length of the fibers. 0 doesn't attenuate the color, 1 attenuates until the tip of the fiber. Self Shadow -> Position = 0.2, 0.5 and 0.7. Opacity controls the opacity of fibers. 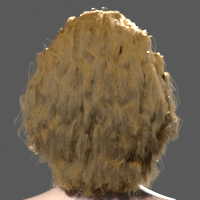 To faster render hair with opacity, it is recommended to activate opacity baking using the Attributes -> Surface -> Opacity Mode attribute. Use either Vertex or V modes for curves. The User Guide/Shading/Opacity section for more information on improving performances with opacity. Opacity -> Opacity controls the opacity of hair in primary visibility. 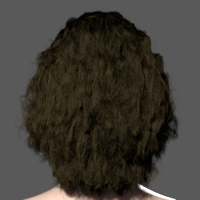 This setting does not affect the hair opacity in shadows, so decreasing this value and keeping the Opacity -> Shadow Opacity to 1 results in darker hair. Opacity -> Opacity = 1, 0.7 and 0.4. Opacity -> Tip Fade controls the starting point of opacity fading along the length of the fibers. 1 doesn't fade opacity at all, 0.5 fades the opacity from the middle of the fibers, and 0 fades from the root. When using tip fading, the fibers are fully transparent at the tip. Opacity -> Tip Fade = 1, 0.5 and 0. Opacity -> Shadow Opacity controls the opacity of hair in shadows. This setting does not affect the hair opacity in primary visibility. Decreasing this value result in brighter hair. Multiplies the final color of the primary specular. Multiplies the width of the primary specular. Multiplies the shift of the primary specular. Multiplies the final color of the secondary specular. Multiplies the width of the secondary specular. Multiplies the shift of the secondary specular. Multiplies the final color of the glints specular. Controls the azimutal width of the secondary glints. Controls the azimutal shift of the secondary glints. Multiplies the final color of the back specular. Multiplies the width of the back specular. Multiplies the shift of the back specular. Controls the azimutal width of the back specular. Multiplies the Back Direct component of the multiple scattering component. Multiplies the Single Scatter component of the multiple scattering component. Multiplies the Back Scatter component of the multiple scattering component. Controls the density of fibers for multiple scattering. 0 results in no multiple scattering (no fiber to scatter light with), 1 results in maximum multiple scattering. 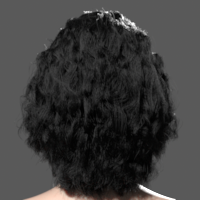 Human hair typically have 0.7 density. Multiplies the Diffuse component color. Note that Diffuse uses the general color settings. Controls the exponent of the Kajiya-Kay diffuse component. 0 results in omni directional diffuse, higher values result in sharp specular-like component. Controls the number of bounces the Hair material allows. -1 leaves this value unchanged from the Diffuse Bounces setting of the RenderPass. Controls the maximum ray length for bounces. Shorter values result in less indirect illumination and shorter rendering time. Multiplies the number of rays shot towards the lights for direct lighting. Multiplies the number of rays shot towards surrounding objects for indirect lighting. Specify the raytracing set for direct and indirect lighting. 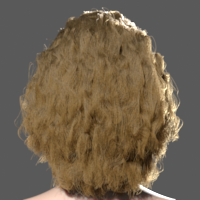 The hair model is provided by Cem Yuksel, and can be downloaded at http://www.cemyuksel.com/research/hairmodels/.